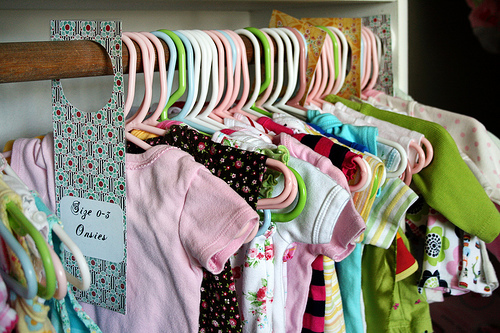 Before Isobel was born I indulged both my love of crafts and my love of organizing by creating closet dividers for the multitude of tiny pink garments we were receiving by the truckload. The project ended up taking up much more time and effort than I had originally planned, but I was fueled by the nesting urge and once I started there was no stopping me. It was so much work I wanted to share the process with others who might be trying to create the same thing so that they could learn from my mistakes. 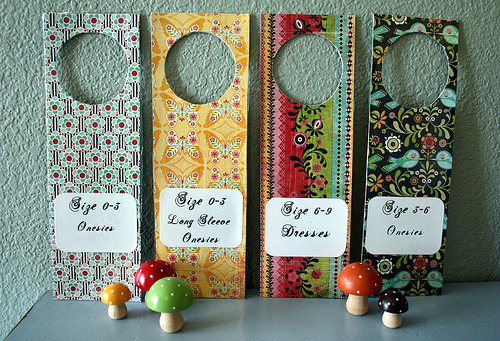 You can find the tutorial here along with a handy-dandy door hanger template I made in Photoshop. Anyway, I’ve been thinking about what do to with these when I don’t need them anymore. I put so much work into these things I can’t fathom throwing them away. I thought about selling them but let’s face it, they are used and could be sturdier. If I’m still blogging by the time I’m ready to pass these suckers down I’ll probably have a giveaway for them, so if you’ve always wanted the closet dividers without all the work, stay tuned. Omar was just telling me the other day that I should make these. I told h I had thought about it but I really have no energy. We are still in process of setting up and organizing the baby’s room now that my dad finally finished painting so I can’t fathom getting involved in such a project at this time. 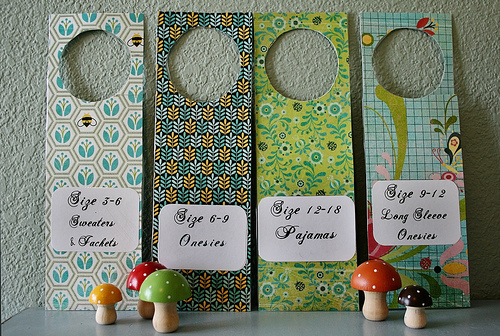 I will definitely stayed tuned if you plan on having a giveaway for these dividers because I think they are so awesome! You know, the only reason I was able to get these done was because I started it in my first trimester and finished in my second. There was no way I could have done this in my third trimester. NO. WAY. The only thing I tried to do my third trimester was make curtains, and that ended disastrously. Even though the task was simple I was so huge I couldn’t get on the floor to measure and cut the fabric. It was so frustrating. A lot of people have suggested I make these then sell them, but honestly? They were so much work. I’d have to charge like a million dollars to feel justified.